There are several types of pour-over coffeemakers that make great coffee conveniently. 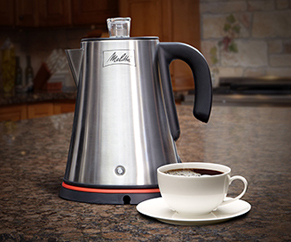 The precursor to the modern automatic drip coffeemaker, the cone pour-over system was invented by Melitta Bentz in 1908 and is still viewed by many coffee aficionados as the best way to make great coffee. The system is quite simplistic. A cone shaped device that resembles the filter holder section of auto-drip machines is placed on top of a mug or (depending on the size) a carafe. A paper filter is inserted into the cone and coffee is inserted into the filter. Water is then poured over the coffee and the flow of water is regulated by a hole in the bottom of the cone. 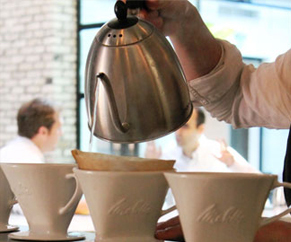 The cone pour-over can be made out of plastic, ceramic or metal. The benefits include: coffee brewed at the perfect temperature, regulated flow of water, optimal turbulence of coffee grounds via cone shape design and one cup at a time freshness. Because of the amount of control it allows you to have for both the water temperature and the brew process time, many coffee aficionados will profess that manual drip coffeemakers provide the ultimate brewing process. If using an electric coffeemaker, we recommend using one with a "cone shaped" filter holder versus a "basket shaped" filter holder as the former allows for better coffee extraction. 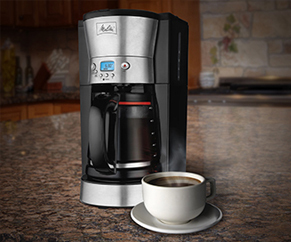 The most common method of brewing coffee in the US is the automatic drip coffeemaker. The biggest advantage of this system is convenience and the simplification of the brewing process. Water is simply heated in one chamber and then piped over grounds contained in a filter. The brewed coffee then drips down into a serving carafe. The negative of automatic drip machines is that cheaper models do not heat the water hot enough so extraction occurs at sub-optimal temperatures. Also, if the machine has a warming plate and the carafe is left on the warming plate too long, the coffee can become burnt and thus bitter. To alleviate this issue, machines with insulated carafes are preferred to those with warming plates. A French press (also known as Press Pot or Plunger Pot) consists of two parts: a beaker-shaped container made out of glass, metal, or plastic, and a plunger, which is a multi-piece wire-mesh filter assembly attached perpendicularly to a metal rod. 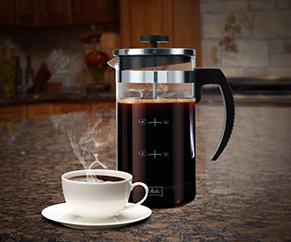 To use a press, place ground coffee (coarse grind) in carafe. Pour in the water and put the plunger in place but do not press it down. Let coffee steep for about four minutes, a minute or two less if using a finer grind. In order to ensure thorough saturation, some people prefer to either stir the grounds about thirty seconds to a minute after adding the water. When the time is up, push down the plunger to trap the grounds at the bottom, and pour out the coffee. Leaving the coffee in the carafe will cause it to be bitter. If done correctly, the French press can make an excellent cup of coffee. The negatives of the system are the inconvenience, degree of clean up required, loss of water temperature, and the maintenance of all residual oils and sediments which some studies cite as having negative medical effects. 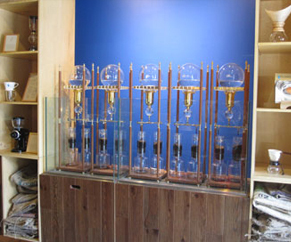 French presses and percolators have the longest brew time and thus the highest extraction levels. Percolators consist of a chamber that holds the water into which a long tube with a filter basket at the top end is placed. The filter basket is generally made of perforated metal. Coarsely ground coffee is placed into the filter and the water is heated either by in integrated electric element or a stovetop burner. When the water boils, it is drawn up the tube and repeatedly passed over the grounds. Percolators are by far the least well-regarded of all brewing methods. The water is overheated and the brew over-extracted. Coffee made in percolators often tastes burnt, especially stove top percolators that sit on the burner after the brew process is complete. 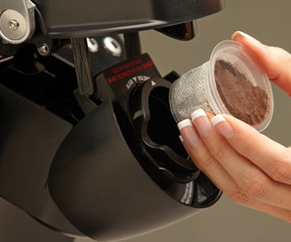 In addition, coffee grounds are usually found in the cup after the coffee is poured. To alleviate this issue as well as to help filter out oils and sediments, we recommend using a paper disc or wrap percolator filter. Although not technically a favorable way to brew coffee, many consumers still love percolators for the hearty body that it provides as well as the aroma that fills the room when it is used. French presses and percolators have the longest brew time and thus the highest extraction levels. Single serve coffeemakers are a broad label that covers a wide range of different types of machines. The one thing that they all have in common is that they brew one cup at a time. Each of these machines is very convenient. The coffee is pre-packaged in variously shaped containers (depending upon the machine) which are inserted into the machine. A button is pushed, and coffee comes out. Some machines have an option to brew with less water, making a stronger cup. These machines range from high pressure machines (similar to espresso machines) to machines which are more similar to automatic drip machines.The type of coffee packaging that is used in the machines tends to be proprietary to the specific machine used. Types of packaging range from pods (coffee includes in a disc shaped filter) to capsules (coffee enclosed in plastic cartridges) to foil packets. Although most of the machines perform well, depending on machine the coffee that is utilized in them can sometimes be stale. If using a pod machine, make sure that the brand you use has pods that are individually foil wrapped. This will ensure freshness. If the pods are loosely packed in a bag, more than likely the coffee will be stale before it is ever brewed. If using capsules always check the production date to ensure that the coffee was packed within the past three to six months. Melitta’s single serve coffee capsules bring freshness and filtration to the Keurig Inc. style brewers. The coffee is encapsulated in a mesh filter cup which allows the user to see and smell their coffee before brewing. Each capsule is individually sealed to ensure freshness. There are many types of espresso makers on the market but in order to brew true espresso, you need to ensure that your machine has a strong pump that can force the water at proper brewing temperatures through finely ground coffee at approximately 9 atmospheres of pressure. An espresso should take 20-25 seconds to brew in a home espresso machine with a strong pump, and should have the consistency of flowing honey. As the espresso flows into the cup, there should be a caramel-colored foam (“crema”) on top. A chamber at the bottom for the water. It has a threaded opening for the top section and a pressure relief valve. This section is almost always made from metal and is filled with water to just below the level of the relief valve The middle part holds the ground coffee. It is a metal ring with a funnel attached to its bottom (all one piece). The funnel is separated from the ring by a screen which usually spreads across the bottom of the ring before it narrows for the funnel. This component is also made of metal. This section simply drops into the lower section, and finely ground coffee is spooned in until full or slightly heaping. The grounds should not be packed. The brewed coffee flows into and is poured from the top section which has a threaded opening for the bottom section and is topped off by a lid (commonly one that flips open and closed). This component varies the most, both in shape and composition. The bottom of this section has a screen very similar to the one in the middle section. This screen also leads to a tube, one that points up into the upper section. The upper section gets threaded onto the bottom section, thereby slightly packing the coffee in the middle section. The assembled device is placed on the stove and the water is heated. Since the lower chamber is airtight, the expanding air pushes down on the water and forces it up the lower tube, through the coffee and through the top tube. It spurts out of the tube (which ends near the top of the upper chamber) and drops down into the bottom of the top reservoir. A moka pot can make good quality, strong coffee. These types of stove top coffeemakers are comprised of four metal parts. One part looks like a very small pot with a handle. The second part, which also has a handle, looks like the first but has a spout. These two parts snap together to form the outer part of the coffeemaker. Inside these pieces is a two-piece assembly that looks like a salt shaker. When the internal assembly is removed and its perforated lid unscrewed, a second perforated surface can be seen inside the "saltshaker" about one inch from the lip. Ground coffee is placed inside and the top screwed on. Water is placed inside the pot-shaped piece and all of the pieces are assembled. The side with the water is placed on a hot stove. When it is hot enough, water will begin to seep out of a tiny hole near the lip of the bottom piece. At this point, you flip the pot over, and the hot water will seep through the coffee into the piece with the spout. Once all the water seeps through (roughly about two minutes), the coffee is ready to be poured. This type of coffeemakers makes a decent strong cup of coffee, but like moka pots and percolators does not filter our bitter oils and sediments. A funnel-shaped bowl is put on top of a carafe, forming a seal. The funnel's tube leads down into the carafe nearly to the bottom. The top of the tube is covered by one of various designs of filters. Fine grind coffee is placed into this top bowl and then the carafe is placed on a gas stove. As the unit is heated the increased air pressure in the sealed carafe forces the water up the tube into the top bowl where it mixes with the ground coffee. When most of the water has moved to the top portion the heat is reduced and the mixture is allowed to steep for a minute or two. The device is then removed from the heat source. As the lower bowl cools its internal pressure drops, pulling the liquid down from the upper chamber. The heating container now doubles as the serving carafe. Because of the filter, the grounds remain behind in the top container. This process produces an excellent cup of coffee. The Ibrik is filled with water (approximately two-thirds) and very finely powdered coffee (roughly one tablespoon per three ounces of water) is added. The coffee should be evenly distributed on top of the water so the opening is not blocked. The coffee should be evenly distributed on top of the water so the opening is not blocked. The water should come nearly to a boil in a minute or two and begin to foam up through the coffee. If your coffee boils rather than foams, you may have used too little coffee or over-heated the water. When this foam rises somewhat thickly, remove the pot from the heat long enough for the foam to settle. The grounds should settle in the cup before drinking.